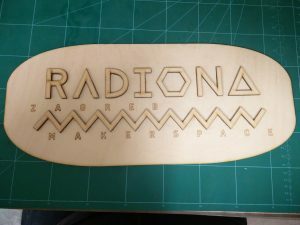 Last October, our own Jeffrey Roe visited Radiona, a makerspace in Zagreb,Croatia. 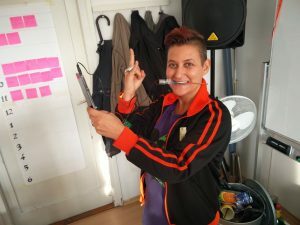 While their he gave Skull Radio workshop and hung out in their space. As a thank you, we decided to make them a new sign for their door. Taking a raster image from the Radiona website, we turned their logo into an SVG and made a sign. We went for a raised lettering effect with 3mm Plywood and using CF glue to stick the letters. For photos of the build, check out our gallery. A video of the sign being cut. Check out some photos of Radiona in our gallery. This was written by tdr. Posted on Sunday, December 4, 2016, at 11:00 am. Filed under Laser, Project, Video. Tagged laser. Bookmark the permalink. Follow comments here with the RSS feed. Post a comment or leave a trackback.